Since L’homme who said too much in 1985, he has produced about fifteen documentaries, many of which have been awarded. Inparticular, between Two Towers (1987), Perm-Mission (1999), The Trap of Kerguelen (2000), Amsterdam via Amsterdam (co made with Rogier van Eck), Queen Mary 2 , Birth of a Legend Stories (2012) which tells of a journey through the cities Amsterdam in the United States. The majority of these films reflect his taste for travel and his fascination for the sea. He is currently making a film about the Dutch writer Robert van Gulik (On the Trail of Robert van Gulik, 2015, 87 min). Rob Rombout was a member of the commission “Brouillon d’une rêve” (SCAM Paris) and of the Commission of the Brussels Audiovisual Center, the VAF (Vlaams Audiovisual Fund), but also vice-president of the Belgian SCAM Committee From 1998 to 2005, and from 2009 to 2013. So yeah this happened , everyone who knows me knows how much of a Bollywood freak I am , so having the opportunity to meet and interview Ashutosh Gowariker was beyond words. Ashutosh Gowariker (born 15 February 1964) is an Indian film director, actor, writer and producer. He is known for directing the films “set on a huge canvas while boasting of an opulent treatment”. His works include Lagaan (2001), Swades (2004), Jodhaa Akbar (2008), What’s Your Raashee(2009), Khelein Hum Jee Jaan Sey (2010) and Mohenjo Daro (2016). He was chosen as a voting member for the Academy Awards in 2005. He returned to acting by playing the lead role in the critically acclaimed dramedy Ventilator (2016). Reena Augustine is the most remarkable young lady you may be fortunate enough to meet. And you surely will meet her in most of the Brisbane events, as a guest, MC or a participant! the club to make. She supports people in so many ways by offering her services free of charge for the community as a photographer, event organiser, stage manager, model handler and many more. Reena works as a migration lawyer in her business, Migration Net, She runs several businesses wearing several hats along the way with each one either bringing people together or providing a service or common cause to help others, while organising fashion shows and events, and doubles up as a charity worker and so much more. 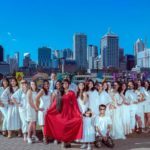 She, in 2015, produced Brisbane’s first multicultural fashion show, uniting over 500 people and many communities to produce a three-hour spectacular, and plans are already underway for 2016’s showcase. 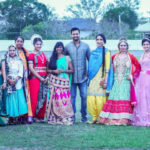 Another project of Reena is ‘Moments With Reena’ which is a show interviewing prominent and motivational people of Brisbane to inspire viewers to achieve things in their own lives and, most importantly, offering encouragement to give back to the community as she does. Showcasing with a selection of the models who work with us. So many smiles and funny moments along the way. A big thank you to everyone for making the journey a happy and memorable one and here’s to many more happy times. Proudly celebrating Indian Independence Day with our ladies representing the states of India. Thank you GOPIO for a wonderful day and thank you to all the team who made it so special. Earlier this month, Moments With Reena had the pleasure of meeting and interviewing Aboriginal Elder and OAM Auntie Flo Watson in her home, in Brisbane. This woman’s workload is remarkable with her resume really needing to be split into chapters rather than mere pages. As an Elder, Auntie Flo belongs to the Ghunghanghi People of Yarrabah, North Qld and is a traditional owner. She also Also affiliates with the Kuku-yelangi people of Laura/Maytown, Palmer River area and the Wulguru Kaba people of Magnetic Island near Townsville. With a background in community work from a very early age, Flo received the OAM in 2015 for her services to the Indigenous Communities of Queensland. Whilst she is very proud of her achievement and recognition, she has not rested on her laurels and is still pushing ahead continuing her sterling work. She works in a great number of roles with skills across so many areas it is hard to list them all here. From consulting on Indigenous government projects to production of information CD-Rom’s to organising and MC’ing events, her effort is always 100% from the heart in all that she does. 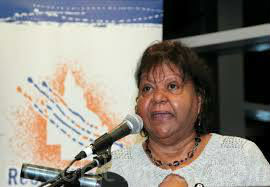 She has even been an Executive Producer on the television documentary; “Yarrabah, the Mission Years”. Combining her knowledge and cultural background has seen Flo work in the education sector also where she has facilitated forums such as “A Study of Rural and Remote Disability Employment Assistance” focussing on Indigenous communities. To anyone who has organised an event you will know the sheer scale and volume of work attached but she continues to produce time and time again. It is not a throwaway line when we say she has too many to list here because she truly does. • Department of Employment Training and Youth Affairs (now DEEWR). When speaking with us it was clear her husband of many years, Ron, was a great support and clearly loved her deeply. It is this type of love and support which is irreplaceable to Flo when she is driving forward with the work which she does. One thing that we noticed (and we are sure others will too) is that her passion and drive remain firmly in the same place they were when she began. She is striving to deliver a better world for everyone and pushing to improve the local Brisbane and wider reaching community. The crew of Moments With Reena were amazed and blessed to be around her. Flo has sat and still sits on several boards with distinction and again, there are actually too many to list here. Her responsibility as an Aboriginal Elder is one which commands respect but at no time does she ever abuse this position choosing to focus only on helping others. We simply cannot speak highly enough of this wonderful lady. Her attention to helping everyone around her is second to none and a joy to see and hear of. It is people like Flo who truly light up the world around us and we would again like to thank her and her husband for inviting us into their home and in speaking with us. Auntie Flo, you are a beautiful ray of sunshine and we wholeheartedly hope you keep spreading your smile around Brisbane for many, many years to come. On Tuesday evening June 28, I had the pleasure of interviewing Mrs Seble Tadesse. Seble is the secretary for the Ethiopian Community and devotes large portions of her time to helping others within the community to settle and live in Queensland. The interview took place at ‘Yeshi Buna’ which is an authentic Ethiopian Cafe located at 131 Moorooka Road. Yeshi Buna is the name of a most lovely gentleman’s wife and he named the cafe after her – who said true love was no more? We would like to thank both Workneh Bayih and Yeshi for their warmth and hospitality during filming and our traditional coffee afterward. Inspiring words for readers from all walks of life and with people like Seble in the community helping and offering a guiding light to many it is clear why so many turn to her for assistance when they need it. She is both respected and loved which was evident during the evening. She truly is a remarkably strong and sincere woman. We were also fortunate enough to be able to look more closely at Ethiopia. Many may know of the name but not many will know about the other parts of the history of the country and its people. Ethiopia boasts a proud history of producing track and field Olympic gold medal winners with several holding world records in distance running. A little research online will see names spring forth like Haile Gabrselassie, Kenenisa Bekele & Tirunesh Dibaba to name but a few. With a population of around 100 million Ethiopia has a rich history and is one of the ‘first’ countries, or masses of land, to be noted in historical texts. It is also the world’s most populated landlocked country…as a quirky fact. It also managed to somehow fend off interest from European superpowers during the late 19th century when many European nations were involved in the ‘Race for Africa’ whereby attempts to over-power and take control of foreign lands were on the agenda. Several other African nations adopted the Ethiopian flag to celebrate their retention of sovereignty as they themselves were unable to ward off the military might of the west. Another thing we did learn was that Ethiopia is the home of the coffee bean. Traditional coffee when made correctly can take 3-hours to settle prior to serving. Coffee forms a large part of Ethiopian life with many conflicts being settled peacefully over coffee. For example, If a man and his wife are at odds with one another the wife will make a coffee and they will settle any differences over this simple drink. Ethiopian people retain a beautiful sense of freedom to their souls and a gentle kindness in their eyes. The western world may be taking over the globe but for many an Ethiopian they retain a proud sense of history and ‘in-tune’ nature with mother earth. One of the most beautiful snippets of information to come from Seble was of how it is recognised as a nation of the divinity in the feminine. When this was explained it was certainly an eye opener and sent shivers down the spine with intrinsic and ancient wisdom still clearly evident in her words. Many critically listed forms of wildlife are also found within the country with deforestation proving to be a major concern for the ongoing welfare and protection of animals listed on the endangered species list. Maybe as a result of the deforestation and ‘developments’ the country has been listed as one of the fastest growing economies in the world by the IMF with a 10% growth in their economy from 2004 to 2009. Whilst economic growth is important, it is clear that for many an Ethiopian their view is protection of the environment and all life forms around them. A very proud nation with links to antiquity, it was an honour and privilege to speak with Seble and experience the hospitality of a traditional Ethiopian cafe and the people who run it. We would like to wholeheartedly thank everyone for their warmth and sharing of some of your countries history, culture and beliefs. If we can all scratch the surface of different cultures it helps us all to realise one thing; we are one. Moments With Reena had the absolute delightful pleasure of interviewing one of the kindest and most sincere human beings you will ever meet, Mr Surendra Prasad OAM, at his home in Wishart, Queensland. At the age of 73, this gentleman, in every sense of the word, continues to dedicate himself to the community and still retains a sparkle in his eyes. Even more remarkable is that, when he looks at you, he does so with a look of total honesty in his eyes of wanting nothing from you other than to say hello and to be happy to meet you. The Indian Community in Brisbane has many different elements to it and follows a structure which one could say is of old fashioned values. That said, these old fashioned values certainly do not do anyone any harm and come with an unwritten expectation to honour thy self – something this man clearly does every day. Dressed impeccably in pristine suit, shirt and tie, Surendra presents, carries and speaks with eloquence and dignity. The old saying of the shine on your shoes saying a lot about you is worthy of mention as his shoes were like mirrors. Being the driving force behind creating the Federation of Indian Community Queensland (FICQ) was something he was and still is extremely passionate about. It is this community based group which saw him unite many different Indian groups together. In 1991 Mr Prasad was instrumental in establishing a Hindu temple in Brisbane…but this was the very first one and to be able to do this took a lot of dedication and commitment to ensure it happened. ‘If you are going to start something then make sure you finish it’ said Surendra. He has held many positions over the years, with some of the highlights being; Vice President of the Fiji Community Association, and is President of the Lions Club of Brisbane Macgregor. He was the founder of the Jyoti Women’s Club and the Fiji Senior Citizens Satsang Association of Queensland, and is patron of Sanatan Youth Sports Club. One of the prestigious positions he has also held was as the Director of the Ethnic Communities Council of Queensland. He was also the Chairman of the finance & audit committee and Chairman of the Multicultural Summit. The Deputy Chairman of Diversity Care was yet another position he held too. He has also worked with leaders of other faiths on many occasions to promote peace and harmony in society which is an action-based continuance of his belief we are all one race. His ongoing commitment to demonstrating a holistic approach to including everyone in society regardless of cultural, ethnic or religious background is an absolute joy to hear and discuss with him. At a time when many have retired and are slowing down, Surendra shows no signs of allowing this to happen. In fact, if anything, he seems to be quickening the pace! His family are extremely supportive and he continues to be an extremely well respected member of the Queensland Community breaking down barriers and stereotypes along the way. The interview for Moments With Reena could have gone a lot longer than it did because when you hear and meet this man and share a room with him, you realise with absolute 100% certainty we are all one human race and we should be helping one another more. If this wonderful man can be so active at 73, be so giving and nurturing of other’s needs, then there is no excuse as to why everyone else cannot be equally as open and active. From the entire team at Moments With Reena we wholeheartedly thank Mr Prasad for his time, dedication to the community and for inviting us into his home to talk with us. We have more amazing people coming your way and will look forward to sharing their stories with you in the coming weeks. Until we meet again, enjoy every moment. Saturday August 6th saw the Namaste World day take place in Rocklea Showgrounds, Brisbane, Australia. On a day which saw near perfect weather, there were stalls, food, local businesses and a whole host of things for the family coupled with a full day’s entertainment schedule which ran from 11am to 8pm. The day was remarkable! Celebrating the wonderful multicultural society which is Australia, and in particular Brisbane, saw several countries represented within the day’s festivities to showcase the oneness and togetherness which helps generate a great sense of community and good spirit amongst us all. The organising committee were extremely busy in the build up to get this festival together but in the end all their many hours of toil and hard work paid off in a day which went off without a single hitch! Gujarati girl and now Australian Citizen Reena Augustine, of Red Carpet Functions, organised the entire entertainment programme which incorporated 9 hours of live performance from models, fashion shows, singers, dancers, bands and more as the crowd, which peaked around 6pm, were treated to a free day in the sun. The success of community events such as these serves well to remind everyone of the happy times we can have if we remove all perceived barriers and simply focus on enjoying ourselves with a smile and happy persona. What was so pleasing to see were the many smiles on the faces of the audience as the day unfolded. Several members of the crowd made a personal quest to shake the hands of some of the performers and compliment them on their singing, dancing or just in general. There was a real old fashioned feel to it all as everyone mingled and were happy to take part in something which was nothing but positive. 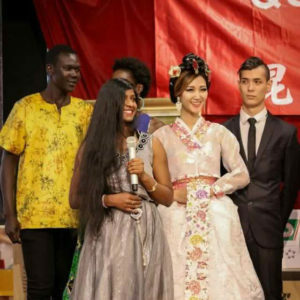 The coming together of many different cultures and ethnicities to celebrate the day together in harmony and happiness was something the organisers had planned but it turned out even better than they could have expected. Life is a beautiful experience and with days like the one Namaste World has recently produced, the world will be a brighter place if there are more of them. Traveling around cultures with Red Carpet Functions Red Carpet Functions Team came together to share smiles, laugh and appreciate each other’s distinctiveness at the heart of Brisbane. 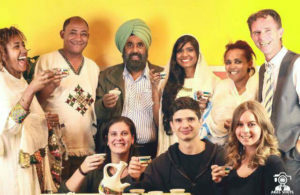 We continuously gather together to remind ourselves of how beautiful Brisbane’s diversity is.